Incredible night sky this evening. Because it is a black moon, the sky is so dark the stars are shinning like millions of diamonds flung across the heavens. What a night. Rick has gone to the local high school football game. I have worked in my closet putting away summer clothing. I know it is still in the 80's here, but I am craving fall color as well as cooler temps. I love the depth that color has in the fall. The turning leaves, the plants that do bloom, all rich and splendid in reds, golds, purples and oranges. Even the greens take on a richness as they fade. Tomorrow we go to a local festival. Rick does their website so it is a work day. 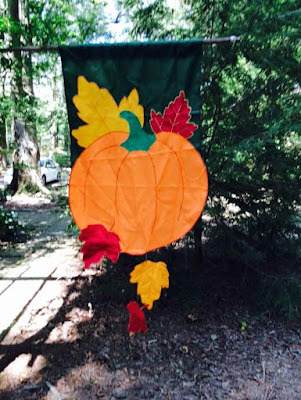 I did my fall decorations today, I am so glad that the fall season lasts so long. My pumpkins and leaves and candles have really dressed up the place. Today is the last day of September, this year is almost gone. Time to do those things you planned, go where you dreamed of going and tell those you love, you love them. Tomorrow is the last day of September and the second new moon this moon and it's a Black Moon. I love the legends of new moons. I love the possibilities of new beginnings, new energies and letting go of what needs to be let go. Sometimes it is not the new we fear, but the letting go of the old and comfortable, the letting go of excess baggage. These past few months Rick and I have been on a mission to let go...of clutter, of things that are no longer useful. It helps to put into perspective that someone else needs it more than you do. Letting go takes on a whole different meaning where I work. People are letting go of destructive bad habits, of people and relationships that are destroying them, of careers that are sucking the life out of them and addictions that are killing them. Many of them let go of a lifetime that no longer serves them. Today, was a difficult day for some of my students, they confronted things they had to let go and it was frightening for them. Tears were shed, and spirits were broken, but you know that when everything is over many will rise like the Phoenix spreading their wings and embracing a new life. The new doesn't come until you have let go of the old. Tomorrow starts the weekend, September will be gone and October will arrive. Enjoy and embrace the new moon, the new month and let go of what needs to be released. It has been a good day. As I cooked supper this evening a momma deer and her young one stood under the apple tree eating apples. I love watching them, but this time of year I always want them to go into the witness protection plan because I know come October 1 the hunters will be looking for them and their sweet faces will hang on someone's wall. We had a great walk with the dogs today, they have finally figured out that they can all share the same space and be loved. It took a awhile for Calliou and Lady ( Jordan's dog) to accept Hook's presence. Now they chase each other through the field and woods, playing and barking as dogs do. It has been a day of catch-up. Laundry, grocery shopping, cleaning, all had fallen behind because we have been so busy the past couple of weeks. Another busy weekend coming up, then one to rest and it starts all over. It is just how life goes. Here's to a weekending with peace and joy. Remember kindness first, and always a hug. As I walked the dogs this morning I realized that whether the temps changed or not, nature was changing. The heat, the drought and now the shorter days are reminding nature that it is time to rest. The zinnias are winding down and it seemed that the butterfly was kissing them goodbye today. Classes today, the difference between power and control and the study of the third chakra. I think students were pleasantly surprised. It was not an easy class, difficult subject matter and lots of planks. Another day in the 90's but there is a rumor that by Wednesday we will drop about 20 degrees. It has been a good Monday for me, hope yours has been a good one as well. Tomorrow practice kindness, even to someone that is unkind to you. I heard Jordan in the tv room today say, "oops, it's ok, I got it." That is never a good phrase coming from an eight year old boy. I walked in and a half jar of roasted peanuts was on the floor and Hook had his whole face buried in the nuts gobbling as fast as he could. Hook is much like another rescue dog we had a few years back. She was a bulldog mix as well and came to us like Hook, so skinny you could count her ribs. She had an eating disorder until the day she died. Hook is the same, if there is food anywhere, even if you just fed him, he consumes it. He has probably gained 20 pounds since he came to live with us. Now we have to control his food supply. Calliou and Taz are so finicky about what they eat and when they eat, I had forgotten what it was like to have a dog garbage disposal. The dog enjoys food and never misses or is late for a meal. This weekend has buzzed by, but then again, so has September. Can you believe next Saturday is October 1? Here's hoping the upcoming week is a good one, remember to laugh out loud and hug someone. I read an interesting quote a few days ago, " you cannot expect to give hate and receive love." I always write the person's name responsible for quotes, but somehow this one slipped by me. I just know those simple words are a fundamental life truth. I teach it to my students daily. Hate builds such a wall, an indestructible wall that can only be torn down by love. People, animals they all pick up on love and hate. I know there is seems to be so much hate sometimes, but a great deal of hate is fueled by fear. We fear the unknown, what we don't know, we fear because the media does nothing but feed fear to the masses. We hate because often we have been taught to hate, we have been hurt, or maybe we are just too lazy to think and figure out things for ourselves. But I know that life is simple and we make it complicated. I do believe this quote tonight, "you cannot expect to give hate and receive love." 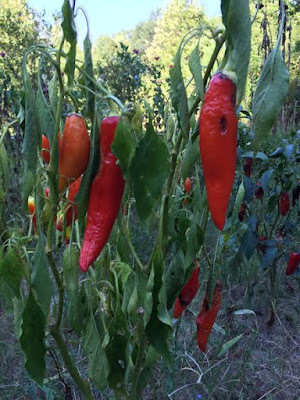 When the weather is so hot and dry that hot peppers are wilting, it's hot. Fingers, toes crossed for cooler temps and rain. First day of fall, high 93 degrees, but there is hope! Our weather guy is saying that by Tuesday we will have rain and lows in the 50's. highs in the 70's. I will be doing a happy dance. So even though it is hot and humid today, Welcome Fall! So very glad you are on your way. Four years ago today, I said goodbye to my first chair buddy. Her name was Rosemary and through my first nine months of IVIG she was always sat beside me while the chemo dripped through her veins. It was not her first rodeo in those big green chairs, but she always had a smile and a hug for me and encouraging words. Her daughter and her son were there for her support. After a few months it became evident that she was losing the battle and she was tired of the fight. We called each other, I sent her cards and notes, she knew there was a place in my heart for her. And then I got the call, she made her final transition, her final transformation and while we, her friends and family mourned, she suffered no more. I think of her so often. I was terrified those first few months and the side effects from the treatments just got worse, but Rosemary always told me I was in her prayers and that she loved me. Her funeral was a heartbreaker, I saw the grief on her children's faces and knew how broken their hearts were. A few years before, I had lost my own mother and knew the hole of emptiness would never fill. I hope Rosemary knew and understood how much she meant to me, how much she helped me. I will never forget her. Four years ago today, RIP Rosemary. As I walked with the dogs this morning a butterfly danced around me. 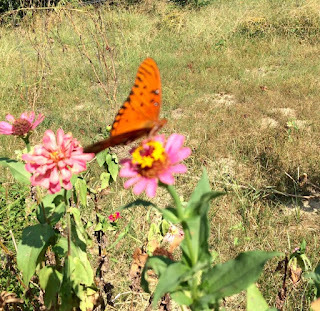 At times she came so close I could have touched her, and then she spied the zinnias blooming in the sun. She said goodbye to me and hello to the old maids. I had my phone in my pocket and holding my breath I went to camera mode. She never moved. I could have taken ten or fifteen pictures, she posed on that flower just for me. Her beauty and willingness to be so close to me took my breath. My transformation today, such a beautiful, fragile creature trusted me to share space with her. This quote came across FB today, smacked me right across the face, sharing it with all of you tonight. "Talking about our problems is our greatest addiction, break the habit, talk about your joys." A day of catch-up and rest, it has been a busy few days and I think the push and maybe a little dehydration caught up with me around noon today as the meniere's and a migraine tried their best to kick my rear. Thank goodness for ice packs, meds and lights that turn off and a cozy comfortable couch. Thank goodness for dogs who won't leave my side and a hubby who tends to my every need. Much better this evening, but I can assure you, I will take it easy tomorrow and not push. But, isn't that what most of us do, push...push when we are not well, push until we are just about past going, push until there is no push left or we collapse. I am not saying that men don't push, because I know they do, but most of the women I know go way beyond push. When we will ever learn? No gigs this week, but practice and learning new songs for the shows in October and November will continue. It is still hot and humid, we did get a shower last night but the ground is still very dry. I told Rick today, we might have to relocate someplace where the heat and humidity is not so bad. The past few months have been brutal. This too shall pass. Wishing you all a brand new week, it's a clean slate, fill it with love, humor and kindness. A gig at the Fall Festival today in Dilworth, Alabama. Handmade crafts, hotdogs and dill pickles, a dunking booth and beautiful quilts, seeing old friends and hearing good friends play their music. 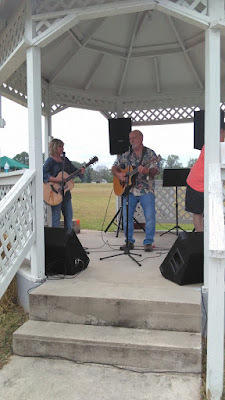 Rick and I had a good time playing our songs for our friends and neighbors. A good day, hopefully a day of rest tomorrow. Full moon tonight and an eclipse ( well not for those of us living in the Americas) but if you see the eclipse please enjoy and know that you have witnessed something special. It has been a day of rest and rejoice. Our gig was so incredible last night, we are both still smiling. We have come to appreciate an audience who does not know us. They are truthful...and we wowed a museum full of strangers last night. We still have a long way to go, and much work to do on our show, but it is coming together and it feels good. Our gig in the morning is for the community where my father grew up. It is a small gathering of those who still live there. But each time we go and perform I feel my father and his parents spirits and I know they love what we do. Here is hoping the full moon brings energy and a sense of purpose to your weekend. May the blessings of a harvest moon fill your life with abundance for the coming months. So tonight's gig was awesome, we're going back in October! Lots of fun and met some wonderful folks. I love art museums. That is where our gig was, it seems fitting doesn't it, art and music. On a subject totally unrelated, our apples are ripe and awesome. 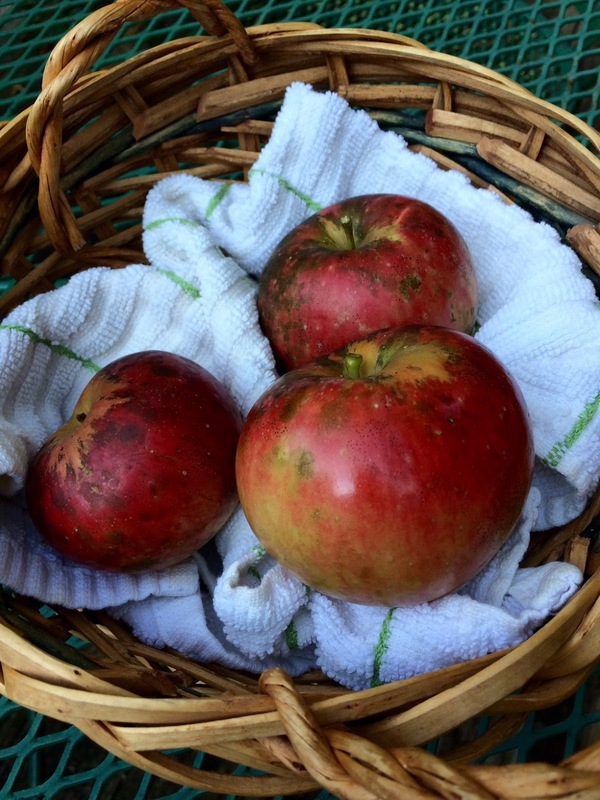 Fresh, crisp organic apples, right here on the farm. The Harvest Moon takes place this week, as well as a lunar eclipse. Lots of activity in our universe, energy brings change just as the seasons change. The sky grows more beautiful each night. I think that each time I look up at the stars and moon, I feel hope. The night sky does that to me. The world can be falling apart all around me, but if I see the night sky and the stars are shinning and the moon is full I figure there are still a few good things. Actually, I think there are many good things. We just let ourselves get sucked into the media cray cray and that is when you have to step back, look at the stars and know in your heart there is greatness, love and hope. We got in a good practice today, we are so ready for our show tomorrow night, and Saturday as well. It feels right to have guitars in hand, mike in front of you face and hear the music come from your heart. Hump day has been a good day. Wishing on stars for all of you, that there is hope, love and joy in your lives the rest of the week. Take a few minutes to remember what is important in your life and celebrate with gratitude. Driving home from work this evening I noticed that there is a transformation taking place. Fall is teasing with some golds and a sprinkling of red in the forests that I drive through. The temps haven't dropped yet, but maybe in a few weeks I can wear boots instead of sandals and sweaters instead of tee shirts. The morning and evening light is changing as well and the sun is showing its face much later in the mornings. On Wednesday when I do my early morning classes I am at work before the sun comes up. I know we humans are not fond of change, but I truly the love the changing of summer to fall and fall to winter. I love the fact that Halloween decorations are in the stores and bags of candy corn are everywhere. Nothing like a bag of candy corn and a jar of salted peanuts dumped in a big bowl together, my favorite treat! We practiced more this evening, the show for the gigs this week is coming together and we are so excited about having a gig Thursday night and Saturday. The moon is almost full, I saw him drifting in and out of the clouds earlier tonight. This is Harvest Moon this week, so he should be full and golden. My cup of tea awaits. Storms moved in while I was teaching the community class, almost continual flashes of lightening. The dogs were stressed when we got home. My brain is fried, no use tapping keys tonight, it's over. Practice makes perfect or at least gets you better. We worked on our show for the up-coming gigs most of this afternoon. It is fun to be writing and playing again. We took a couple of months off for the summer, but by the end of August we were both itching to get knee deep in the music. The moon is blossoming like a pearly rose up in the night sky. I looked out in the darkness a little while ago and the roundness is coming fast It will be in all in its full glory by the weekend. The rain dance worked last night. We got about a quarter inch or so and it was glorious. The smell was intoxicating, we were both giddy with delight as those first few drops hit the dry earth. I hope your week is a good one. Don't forget to laugh, hug and love. Our friend and sound man extraordinaire Fred came over this afternoon. He helped us get our sound system ready for our gig Thursday night and he and Rick and I finished a song that we had started last year. Sometimes it has to evolve. But this one evolved into a killer song and I can't wait to sing it. It will be on our new cd. Tomorrow we will rehearse and get the show ready and once again check out the sound system. It takes a great deal of prep to do a show, especially when you are the show, the sound crew and the roadies. :) I tell my friends there is nothing to it, I can load equipment in 3inch heels and full make-up. There is a tiny band of rain northwest of us tonight, we have done a rain dance and now we are hoping that those drops come on down to our house. I hope your Saturday has been a good one. Wishing you a peaceful Sunday. I stepped out on the back deck tonight to feed Hook and looked up at the sky. Almost a half moon, and stars twinkling all through the darkness. It took my breath. When you take a few minutes to look at nature, she does that you know, she takes your breath. We live on a planet full of beauty. When you think about the ugliness that we see around us , it is usually human induced. Oh I know Nature has a few temper tantrums from time to time...storms, hurricanes, earthquakes and the such. But I wonder even with those, how much of them have we caused. The gaping wounds from open mines, the oil slicks on the oceans, the fires in the Amazon, so many of the ugly disasters can be traced back to man. Wars destroy countries and cities, poverty destroys communities and hate destroys humans and greed, well that destroys everyone and everything. That is why I am often encouraging you to look for the beauty. It is there, and we have to remind ourselves to see it. So tonight, if you can look up at the night sky, appreciate its beauty and be grateful. Sit still and breathe. That is a hard thing for most of us to do. We are so use to working, going, being busy and never sitting still. Sit still and breathe, your body needs it, you brain needs it, your spirit needs it. Do it for yourself, and for those around you. So what does sitting still and breathing do? It is calming, healing, nurturing. Your blood pressure will thank you, so will your anger, your depression and any illness that you might have. It will help you focus and handle life's issues a little better. You will make better choices. Sit still and breathe. Start with 2 minutes, set the alarm on your phone. Turn off the tv and find someplace quiet. Close your eyes and sit still and breathe. After a few days, add a couple of minutes and soon you will sleep better and have more energy. In a few more days, add more minutes, it works. Sit still and breathe. You will be able to tell your friends and family, " this meditation stuff works." Hump Day, Wednesdays are always jammed. Early class, today a trip to Costco, laundry, writing my column for The Leaf and practice for our gig next week. I am so ready for bed. The dogs are snoring. The heat is really wearing on them. They go outside to run, and before you know it, they are looking for water and the cool shelter of home. We are getting color in the woods, but it is not our normal fall tones. Everything is just turning yellow and brown and dropping to the ground. Heat and no rain is taking its toil. Here's to a Thursday that is smooth and easy. The weekend will be here before we know it. I saw the doc today for a follow up on my Meniere's diagnosis. He had told me at the beginning a few weeks ago, that the hearing in my right ear was almost totally gone. He also said that he didn't think I would regain any of it. Since the meds had helped so much with the episodes and symptoms I thought for sure that some hearing had been restored. After the hearing test today, I found out none had been restored. Yes, it was a big let down. He said there is still some hope, that since I am responding to the meds so well, that maybe in the next few weeks and months there will be some restoration. Hopes and prayers that he is right. My transformation today...it has been four years since I have driven in the city alone. Between the aseptic meningitis episodes and the meniere's symptoms I had driven around home and back and forth to work, but not the city. Today was a big step for me. I admit I was nervous this morning, but I made it fine and my confidence soared. Until you have known the limitations of chronic disease, please don't judge. 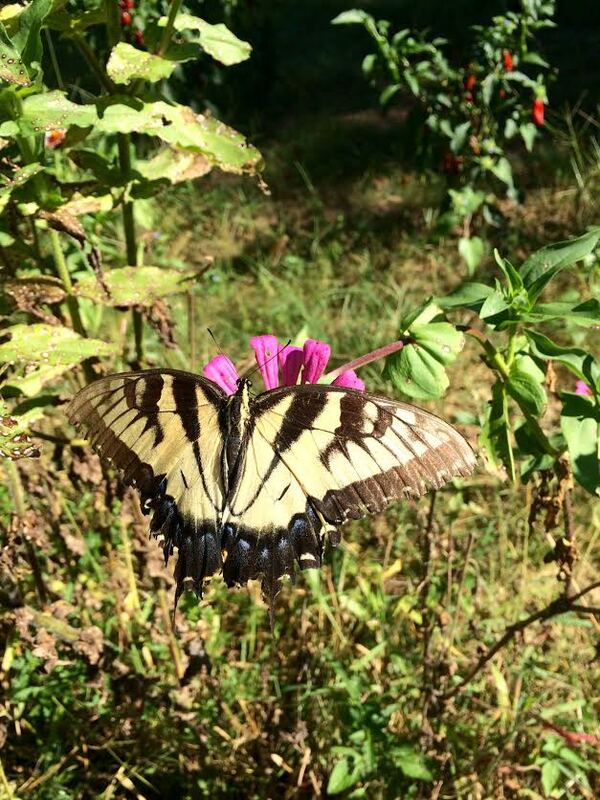 Today I felt like a butterfly spreading her wings. There was fear, but I remembered to breathe. I asked the Universe for my portion of grace and it was delivered. So tonight, I am grateful that the hearing in my left ear is almost perfect. Grateful that I found a doctor who is compassionate and encouraging. Grateful for a diagnosis, grateful for meds that help the symptoms, grateful for my life. Full classes today, many of my students will be leaving the program in a couple of weeks. Soon it will be all new faces. That is the hard part of my job. Saying goodbye, hoping for the best. Still so very hot here, the colors of fall are starting to appear in spite of the heat. Rick has been so inspired by our new doors that he is now working on a small patio out front. It will be beautiful. Last night was a rough night for me. Sometimes I inhale, but the exhalation process becomes difficult. I sat up for a great deal of the night, using my inhaler waiting to exhale. I think it was finally around one this morning when my breath returned to normal. For those of you who were off today I hope your holiday was fun, full of good food and fun times. For those of you who labored like I did, I hope you get an off day soon. My weekend is over way too fast. I will work tomorrow, so I did my Labor Day ribs this evening. I am so stuffed. We had lunch with my sister Pat today, it seems I have eaten my way through this Sunday. But, it was all so tasty! When I was a very small child our hometown had Labor Day Picnics/BBQ. The Lion's club and other organizations as well as the city council and mayor would do the BBQ. There would be a beauty pageant, ball games, and kids everywhere in the park. A few years ago we spent Fourth of July with friends in Telluride, Co. That 4th of July, Telluride reminded me so much of my hometown all those years ago. There was a parade, a BBQ in the park and all sorts of games and activities for the kids. That is when I truly fell in love with Telluride. The beauty of the village surrounded by mountains was incredible, the town spirit unlike no other place I had been to in years in this country. Don't forget that the blood, sweat, tears and lives of our labor unions gave us this holiday. I come from a family of blue collar, labor union members and I am proud of my roots. Happy Labor Day! Enjoy your holiday tomorrow. The carpenter arrived at 6:30 this morning. I made a pan of biscuits, bacon and eggs. It is important to keep your carpenter happy and well fed. Coffee and water are important too. The new doors look great, but they were a bear to install. Between Rick and the carpenter, I heard a few moans, ughs and swears but they did a good job. I love our new handyman. He is prompt, polite, picks up after himself and does great work. I have a list of jobs for him, soon I will have him on speed dial. Rick's honey-do list just got shorter. In the midst of all the hammers, sawdust and expletives, the kids decided to come over. Samantha and Jordan, Haven and Alesha and Anthony and James and Andrea and Stone, Breeze, Daisy and Joy. The dogs, especially Hook were delighted to have kids to play with. For and hour or so it was complete bedlam. My head is still spinning. I had also decided to bring yoga mats and blankets from work to wash this weekend. I must be crazy. My transformation today, just sit down and let it go. After awhile, it just got funny. A hot shower saved me. Rick is watching Alabama football, I have been trying to get some semblance of order back in the house. I will probably go to bed way before he does tonight. I am spent. But, we did have baked salmon, and fresh green beans and new potatoes for dinner. I am never too tired to cook. Hope your holiday weekend is a good one and if you are a college football fan, hope your team wins. Another early day at work, this time for re-certification in CPR and first aide. I am so use to working afternoons that when I go in early morning I am out of sorts all day. I also dealt with a migraine most of last night so there was a double whammy this morning. I am envious of those who got cooler temps today, but at least our humidity dropped. In the past twenty-our hours we received 4 gig invites! We have accepted 3 of them, we have happy danced all day because of our bookings. Keep calling, we are loving it. We are getting our new garden doors installed tomorrow. They are just like the old ones, but in much better shape. :) It will spruce up our deck so much. Rick also found a beautiful garden bench yesterday. Still trying to decide where it will serve us best. Right now, it sits ( invitingly) by our front walk. Our friend Skip was playing tonight and originally we had planned to go, but as the day went by, I knew in my heart I should stay home and recover from the migraine fully. Hot tea is waiting, and my cozy bed. Wishing you all a fun end to summer and a great beginning to fall. Enjoy your Labor Day weekend.